Despite a series of recent announcements of new works teams in Formula E, the series didn’t do so great in its first year. It posted a loss of $68.4 million for its inaugural 2014-2015 season, per Sports Business Daily. Ouch! Formula E started off with a relatively spec car, a schedule entirely comprised of street courses on city roads, and some races, such as Long Beach, even had free entry for spectators, per Road & Track. Formula E Team Owner Jay Penske is “not at all” worried about the series’ recently revealed $68.4M loss for its inaugural ’14-15 season. 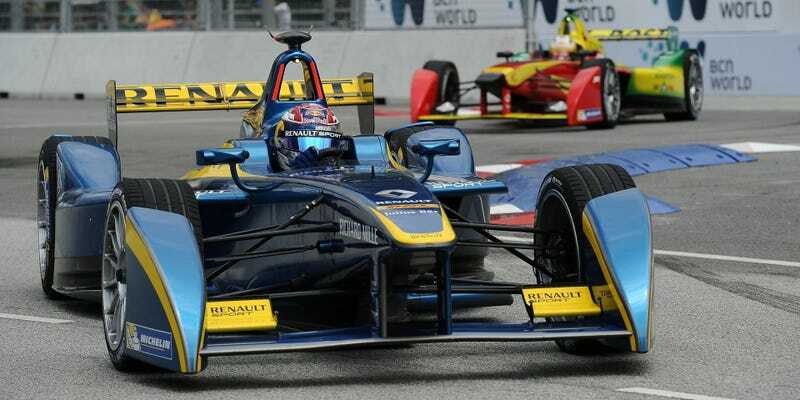 The electric racing series’ financial accounts also showed it generated only $3.1M of its total revenue of $23.1M from sponsorship deals, which include companies such as DHL, Visa and Julius Baer. Dragon Racing team owner and Penske Media Corporation founder Jay Penske compared Formula E to a startup, explaining to Sports Business Daily that it’s common for startups and new racing series both burn through cash in their first year. There’s some hope that Formula E’s making up for it now. Sponsorship of a road-relevant, “green” series has been an incredibly easy sell, and with the series gradually opening up items in the cars’ drivetrain to development, we’re seeing even more manufacturer involvement than before. Audi and Jaguar were the most recent two to confirm works entries for Formula E’s upcoming third season, when the battery will finally be opened up for development in addition to the inverter, motor, controllers and gearbox. Of course, these companies aren’t just doing it for development purposes. Companies want visibility. If the fans don’t follow the manufacturers into Formula E, will those works efforts stick around? After manipulation of FanBoost votes (an irritating gimmick where fans vote to give one competitor more power to use during a race) was uncovered by Formula E Zone this year, I’ve even had a harder time taking Formula E seriously despite generally enjoying the racing. Driver Lucas di Grassi’s concerns that FanBoost would affect the championship went largely ignored by the series when no, the FanBoost system is a problem that should go away. And then, of course, guys like Raphael Orlove and Marshall Pruett have voiced the all-too-common opinion that Formula E just isn’t interesting to them. The cars still look identical, despite changes underneath. They’re slow. They don’t make any kind of viscerally loud race car sound that racing fans enjoy. There’s Formula E’s problem right now: manufacturers may find plenty of relevance in the cars, but fans often can’t.